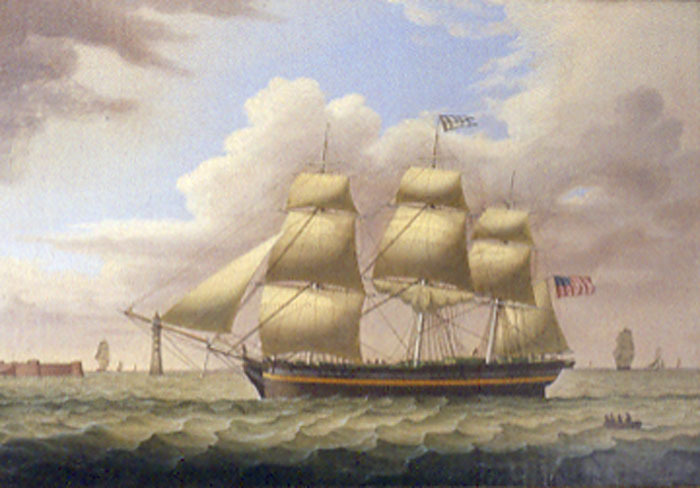 Marine painting featuring an accurate depiction of a vessel, usually commissioned by the owner or captain., some of American scenes and some recalling scenes from his home country. He painted about 1,000 paintings during his career. Vessel with two masts; both square-rigged. built in 1806, and sold in 1816. In 1811, the Sheldrake distinguished herself. Serving in the Baltic under Commander James P. Stewart, she fought Danish gunboats four times and captured or destroyed five. To finish off the year she took a French privateer. Stewart was promoted to Captain for his good work. Stewart may well have spent some of his new pay and prize money to have Salmon paint the ship that brought him luck and a promotion. Joseph Heard (1799-1859), another Liverpool artist, painted this picture of the packet Margaret Johnson, shown here off South Stack Light, Anglesey. 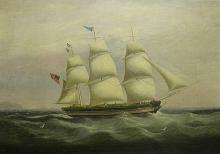 John Hughes (1806-1880) painted the Castine, Maine-built ship St. Leon in Liverpool in 1838. She was owned by Castine merchants Witherle and Jarvis. 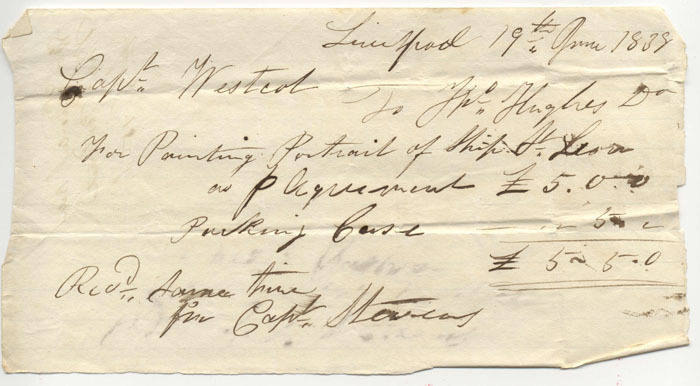 The Witherle papers are in the museum's archives, including an invoice from Hughes for the ship portrait (5 pounds) and the packing crate (50 pence.) Hughes painted many works for American clients. Charles J. Waldron (1836-c.1883), like Hughes, painted in Liverpool. In 1869 he painted the Phineas Pendleton, named for a Searsport captain and built in Brewer, Maine. 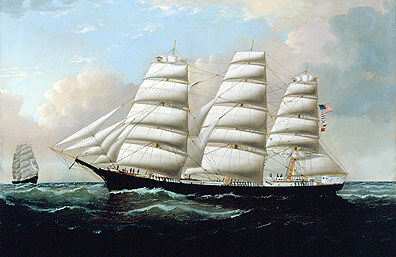 Another Waldron Liverpool painting showed the Great Admiral, built in Boston in 1869. The Great Admiral had an active life of 37 years. 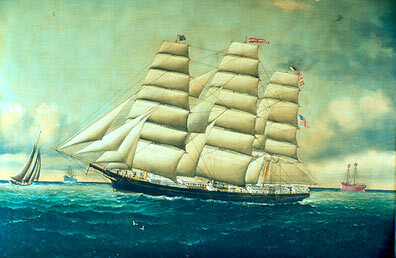 Winterport's Benjamin Thompson commanded her for 12 years and commissioned this painting. William G. York, or Yorke, was born in 1817 in New Brunswick, but emigrated to Liverpool about 1850-53. His son, William H. York(e), was born in Liverpool and remained there throughout his life. William G., however, moved to New York around 1871, then returned to Liverpool sometime after 1886. To complicate artist identification, besides having similar names, both the father and son added an e to their name in the 1870s and 80s. 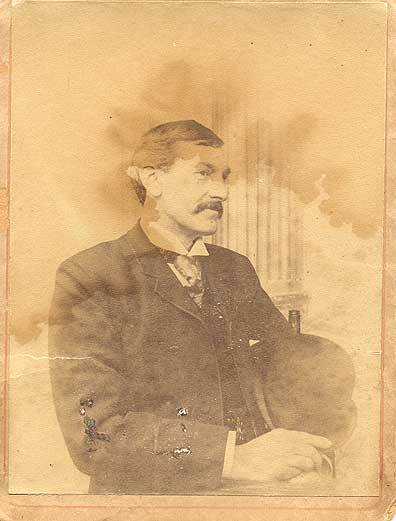 This photograph shows William H.York(e).